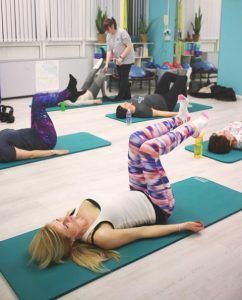 Pilates as an exercise form is low impact and still focuses on the mind–body connection. By using controlled movements, the body can develop strength, flexibility and tone which is why it can be very beneficial to those with injuries. Because of the concentration and precision needed to perform the movements, it is a great way to re-connect with your body whilst providing even the fittest with a challenge. During classes I will encourage you to work at your own personal ability level and provide adaptions where needed. I don’t believe in excluding people from classes if they have certain needs. I would rather have them in class than not have any help at all. For certain needs an initial one-to-one session may be advised to help you prepare for the class and to go through any modifications needed. I trained with Michael King Pilates due to their focus on applying the latest research into teaching the method. MK Pilates has a strong belief in applying movements to each individual and should complement other forms of fitness and exercise. To avoid inconsistency and to ensure commitment, classes are booked as blocks in terms of usually 6 weeks. If you need to miss a class, you can catch up in another class during that term, as long as more than 24 hours notice is given. One-to-one or private corporate classes are also available on request.